'Tis the season for GeForce RTX gaming laptops. 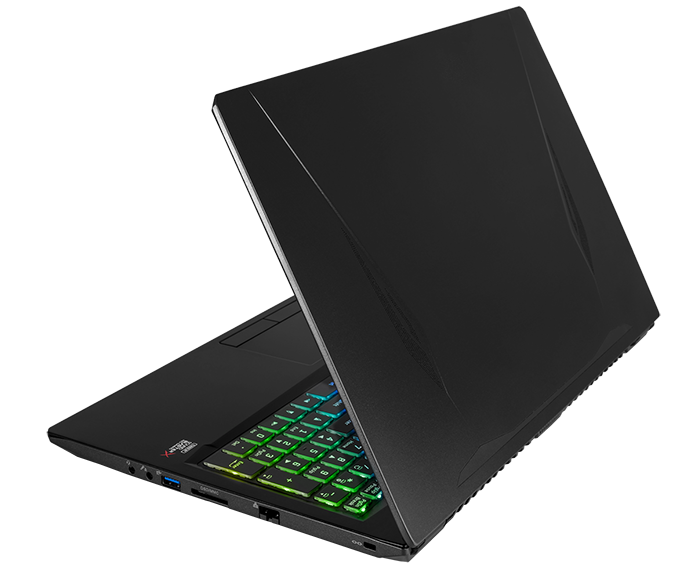 Having unveiled its latest mobile GPUs back at CES in January, Nvidia has been adamant that consumers will be spoilt for choice, as laptop vendors prepare to unleash a wave of supporting systems. We've already seen Gigabyte attempt to shoehorn the GeForce RTX 2070 Max-Q into the premium Aero 15 X9, and today we turn our attention to UK-based system integrator PC Specialist, whose 16.1" Defiance V RTX touts immense graphics firepower for a more palatable sum of £1,999. The obvious benefit of choosing a boutique system integrator is that prices tend to be more competitive. Whereas the likes of Asus, Gigabyte or Razer will charge significant premiums for custom designs promising greater refinement, PC Specialist simply takes an off-the-shelf body and equips it with the latest parts. 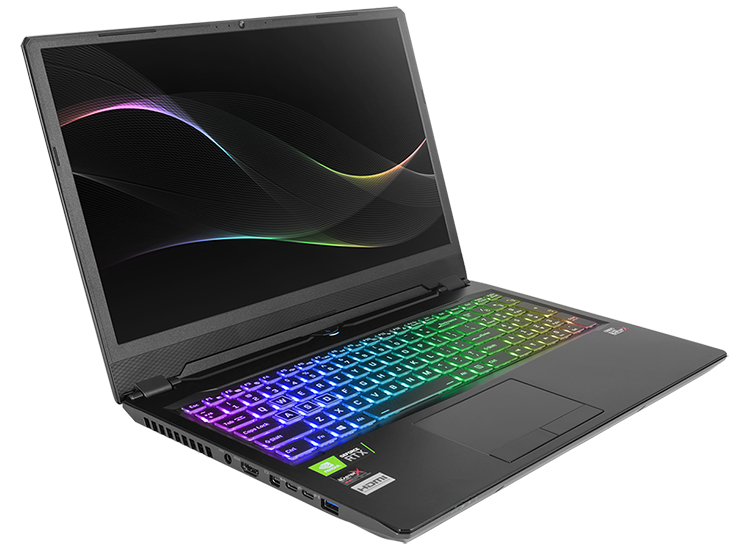 What's interesting about the 16.1in Defiance V RTX is that it's the first laptop we've seen employing Clevo's new P960EN chassis. At first glance, it's an intriguing unit that squeezes an Intel Core i7 processor, GeForce RTX 2080 Max-Q graphics and a 16.1in display in a 2.3kg form factor that's barely any bigger than most of the competitors in its class. Despite the larger display, dimensions of 380mm x 252mm x 19.9mm ensure that Defiance V RTX adds only an extra 24mm of width and 1mm of height compared to the aforementioned Aero 15 X9. Narrow bezels help make everything possible, and for a powerful gaming solution, it's a surprisingly sleek piece of kit. How powerful, exactly? The £1,999 model being reviewed today is expected to become available at the beginning of March and will pair the ubiquitous hexa-core Intel Core i7-8750H processor with 16GB (2x8GB) of DDR4-2666 memory, GeForce RTX 2080 Max-Q graphics and two storage devices; a 512GB Samsung 970 Pro M.2 SSD plus a 1TB Seagate HDD. All that is hooked-up to a 16.1in IPS panel touting a full-HD 1080p resolution and a fast 144Hz refresh rate. The perfect blend for gaming, it seems, though do be aware that the Nvidia GPU is of the Max-Q variety, meaning implementation in a thin laptop such as this comes at the expense of operating frequency. Putting it into numbers, both the desktop and mobile parts share the same core composition of 2,944 shaders, 184 texture units, 64 ROPs and 8GB of GDDR6 memory accessed via a 256-bit bus. What sets the chips apart is clock speed, with base and boost clocks falling from 1,515MHz and 1,710MHz on the desktop part to just 735MHz and 1,095MHz, respectively, on the mobile Max-Q chip. That's a huge downgrade, and effective memory speed also drops from 14Gbps to 12Gbps, so don't expect a laptop equipped with RTX 2080 Max-Q to replicate what you're seeing on your RTX 2080 desktop; it won't come close. Still, there's an impressive amount of tech inside this 19.9mm frame, and connectivity options are plentiful, too. Spread across both sides of the laptop are two USB 3.1 Type-A, two USB 3.1 Type-C, HDMI, mini-DisplayPort, an SD card reader, audio jacks and Gigabit Ethernet. If there's a criticism it's that the position of the power connector isn't ideal - the cable always seems to feel like it's in the way when jutting out from near the middle of the system, and we'd prefer to see it further back. For performance fiends the 16.1" Defiance V RTX ticks a lot of the right boxes, but as expected the Clevo chassis doesn't exude absolute quality. The entire case has a plasticky feel to it, there's some flex to both the display lid and the keyboard tray, and though the keyboard and trackpad are perfectly adequate, neither is memorable. The trackpad buttons have a mushy feel about them, and though it's nice to have an RGB keyboard, the lighting on offer here is almost too dazzling and needs toning down for comfort. Sound output, meanwhile, is disappointingly flat, with the stereo speakers delivering plenty of volume but a real lack of depth, however we like the fact that the webcam has been kept at the top of the display. Granted, it's only a 720p cam with mediocre image quality, but at least it isn't pointed up your nose. Going back to the subject of finesse, we've seen various manufacturers adopt different tricks in an effort to increase battery life and reduce noise/heat output. Clevo's P960EN takes an old-school approach, with no fancy power profiles and a trio of fans that is almost always pushing a good amount of hot air out of the vents. 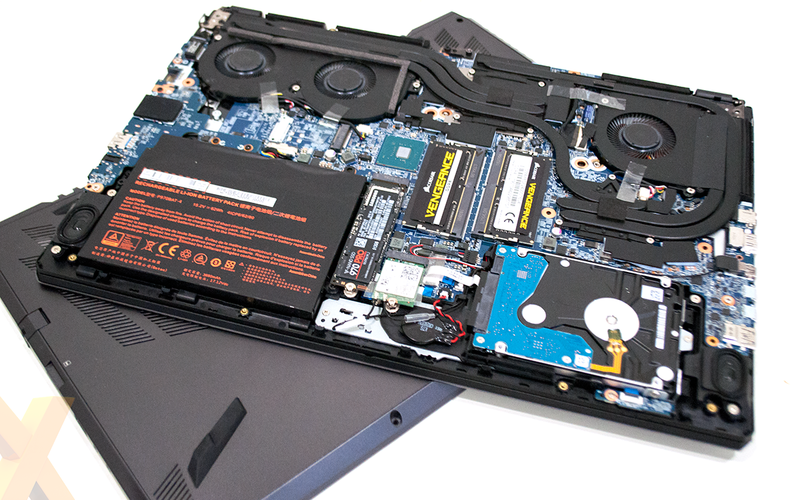 They aren't the quietest - the laptop can be heard at all times and gets noticeably loud when gaming - but as the benchmarks will soon show, the fans do a decent job of keeping the chips running at consistently high speeds. We see a spare M.2 slot allowing for a simple storage upgrade, and cleaning the fans shouldn't be too much trouble, though it's worth noting that removing the bottom panel isn't entirely straightforward. First, remove the two screws on the back that hold the keyboard in place, then pop the keyboard out to reveal a further four screws. Undo those, flip the laptop back over to remove the remaining screws, and the back panel ought to then come away. That concludes the product tour, now let's see what RTX 2080 Max-Q can do in the benchmarks, shall we?